For a day or three prior, April 19th was looking like a decent shot at severe weather along the warm front and near a surface low that was expected to be in Southwest Illinois. The SPC had outlined the area in a moderate risk and had a 10% tornado outline for Southeast Missouri, Southern Illinois and Southern Indiana. The Indiana portion would be for after sunset, so that wasn’t considered in the selection of a target. I took off from Michigan pretty early and headed down I-57. My goal was to find the warm front and then hang out and decide whether or not to forge westward. I arrived in Effingham, Illinois just before 2pm CDT. The SPC had issued a Tornado Watch for the area an hour earlier. 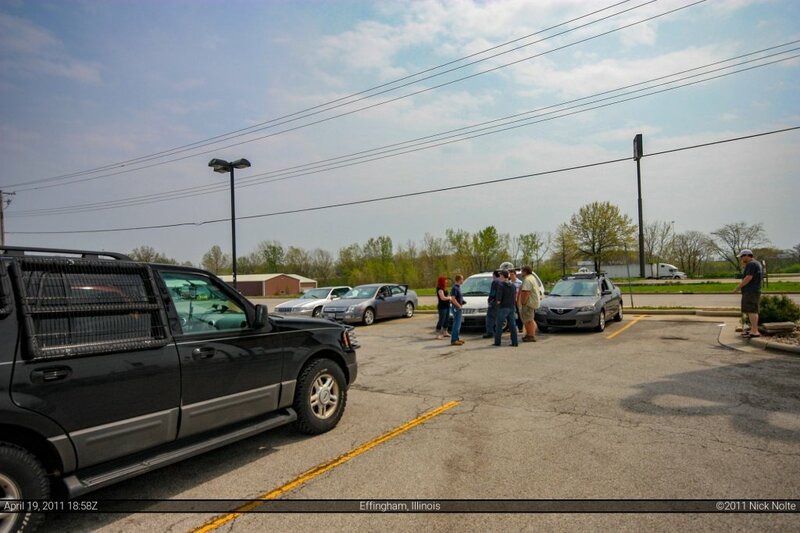 Eventually a few other chasers met up to hang out under the blue sky. Skip Talbot came down with photographer Jennifer Brindley. Andy Wycislo arrived shortly thereafter. And shortly after that Adam Lucio, Danny Neal, Mike Boik, Allan Deitrich, Jonathan Williamson, Dave Marshall and about 10 other people I cannot remember names  It was a regular chaser pre-initiation pow wow. The 1630Z update from SPC hatched the tornado probabilities for our area, which increased out optimism slightly on how the day would play out. We all waited around for a while waiting patiently. Storms began to fire along the cold front, which was still in Missouri. Initially the storms were struggling with the cap that was hanging around, and even the forcing from the front wasn’t quite getting them going. Skip and I were intently watching satellite like hawks as a Cu field was developing right over us. It was starting to become clear we were probably too far south of the front and a northward retreat was in order. At about 3:45 pm CDT, the triple point storm that fired along the cold front looked like the one of main interest. I took off from Effingham and began a northwestward track to position myself closer to the triple point as I figured that storm would push off the cold front and ride the warm front. The storm became tornado warned at 4:31 pm as it crossed into Illinois in Calhoun County. At that point I was about 90 miles east of it, so I figured I’d be able to meet it in about 50 miles and give it time to get organized. At 5:00pm the tornado warning was extended into the adjacent county. At that point I was just passing through Taylorville, which would later see tornado damage just north of town. At this point I was closing in on it, I could see it to my west and I continued towards it on highway 104. Once I got to Pawnee, I hit Co Rd 700 to the south to line myself up with the southern edge of the storm so I could intercept from the south and avoid driving through the core. At 5:36, the tornado warning was issued for Macoupin County as I was 8 miles east of Girard. I continued on and at 5:47 drove through Girard. Noting that the tornado sirens were not going off and that the storm was impending I reversed course along Old Country Rd up to Bumpus Rd (also 31500N). I stopped 2.75 ENE of Girard and positioned myself to observe. Shortly after 6:00pm is when I noticed the rain free base and a lowering which appeared to be a wall cloud. I appeared to be a few miles away still, so I couldn’t tell if there was any rotation. As the storm progressed east, the lowering became more ominous and it appeared this thing was going to produce any second. It appeared that a debris cloud was visible below the cone shaped lowering, but it was difficult to tell. 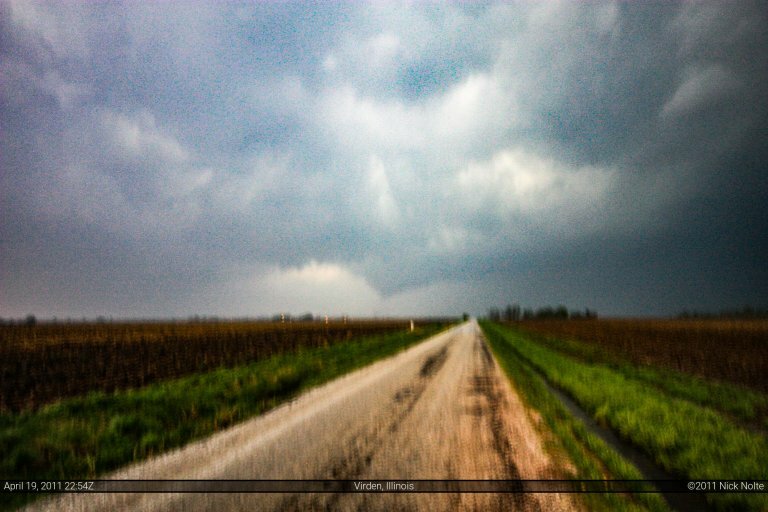 I began to film the “tornado” and realizing I was probably three miles away I got back in my car and edged westward a little bit. During this repositioning is when power flashes became evident on the horizon. I had a tornado. As I edged a quarter mile back towards the storm it started to become lost in the rain, and lack of contrast caused me to lose visual. Because I could not see it, I decided it prudent to retreat east and try to get distance as well as visual. Just as I began to turn around, it became visible again and I started filming again. You can see the power flash at the 1:15 mark in the video. 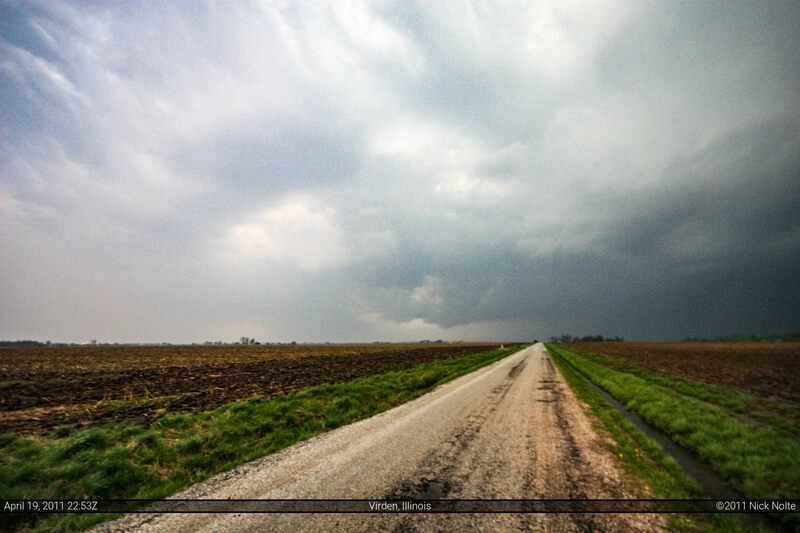 As the tornado continued to move towards my location, I eventually bailed east and lost visual. According to the damage survey it lifted 3 miles ENE of Girard, which is about where I positioned originally, so in hindsight, I probably didn’t need to bail, but you don’t mess with Mother Nature! After tracking the storm across I-55 to see if it would produce again, the storms began to line out and it was about time to call the chase. As I navigated back country roads to find a highway, I crossed paths with Skip Talbot and Jennifer Brindley where we recounted our successful day in the rain. All in all, a successful chase day, even though we were originally too far south and east. At 3 pm CDT, the surface low was located just west of the Illinois border where our initial storm would go up. The proximity to the surface low provided our storm with ample low level helicity on the order of 200-300 m2/s2 in the lower 1 km. And while the low level jet wasn’t impressive, it served to improve hodographs for our storms and get them spinning.